So, the other day I had this Chevrolet Impala come in the shop. It was dropped off by a local body shop who had repaired the front end of the car from an accident. It had been pretty severely damaged, with a hard hit to the left front fender/hood area. 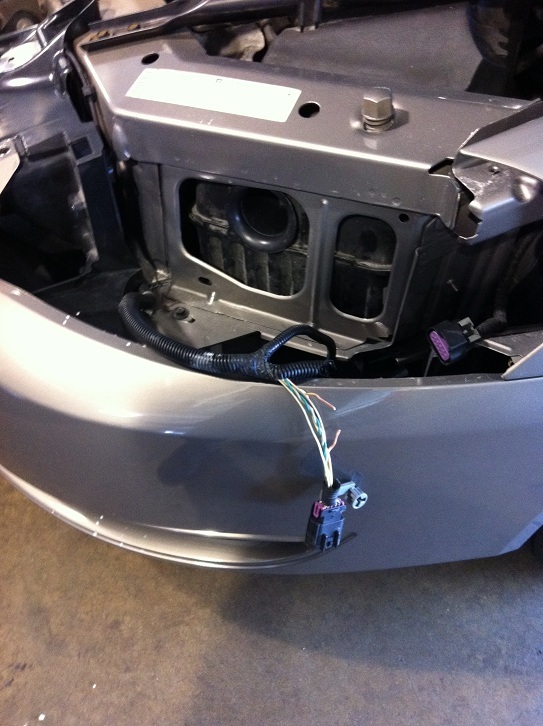 After repairs from the body shop, the Airbag Light was still on inside the car, indicating there was still an electrical problem with the Supplemental Inflatable Restraint System. The body shop had replaced the left front impact sensor located on the core support near the area of the impact. The car came to me because they couldn’t figure out why they still had an airbag light on and ‘service airbag’ message on the dash. I took some of the front end components apart, like the headlamps, grille insert, etc, so I could access the area where they had made repairs. I diagnosed the airbag light as having a code still for the left front impact sensor, so I knew the problem was most likely in that area. I saw the new impact sensor they installed, but just to make sure it was functioning correctly, I swapped it with the right front impact sensor just to see if the code changed to the right side. It did not, so I knew there had to be a wiring problem or something wrong with the Sensing and Diagnostic Module (the airbag computer). Luckily, the main harness across the front of the car had a large connector near the left front wheel well opening, so I could disconnect it and check the wiring fairly easily at least from there to the sensor. A quick continuity check revealed that I had an open on one of the wires going to the left impact sensor. The other wire was fine. I knew the problem was somewhere along the harness in the front end. I stripped off the tape and conduit protector from the harness and noticed a spot in the harness where it looked like it was smashed. This was obviously at the point of impact in the accident and actually ended up cutting the one wire that was open. It was cut so cleanly, it looked like it was snipped with wire cutters. The location, right on a sharp angle of steel, just happened to be the exact place the harness rested during the wreck and got cut just like a knife. I was able to run a new wire along that front harness and also installed a new connector to the left front impact sensor. It seemed a little damaged, so as a rule of thumb it should always be replaced since it handles the occupants safety. These are just some of the things we see daily coming in from body shops. They can only do so much in actual mechanical repair and sometimes need the dealer to do the intricate electrical work and replacement. Programming, setting up, or replacing modules is a common thing too. Most body shops just don’t want to deal with that part of the repair, or don’t have the ability to make those repairs. You should always take your vehicle to a trusted body shop if you are even in an accident, and if the airbags are deployed or the airbag light is on inside your car, make sure you get the proper repairs done. You can fairly expect to get your car back just the way it was. 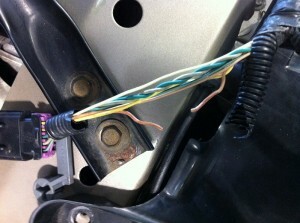 Below are a few pics of the exact wire breakage, where you can see the location and how finely the wire was cut. Odd things can always happen in an accident! 7 Comments on "Body Shop Repairs Cause More Car Problems"
Some one put transmission fluid in were the brake fluid went.how much would it cost to fix.it is a 1999 dodge Dakota ram. That all depends. If it is throughout the system and has been that way for a while, then all if the rubber components should be replaced- this includes hoses, wheel cylinders, calipers and master cylinder. If the problem was caught right away, then just a brakes system flush will take care of it. Most likely a problem with one of the wheel speed sensors for the ABS. 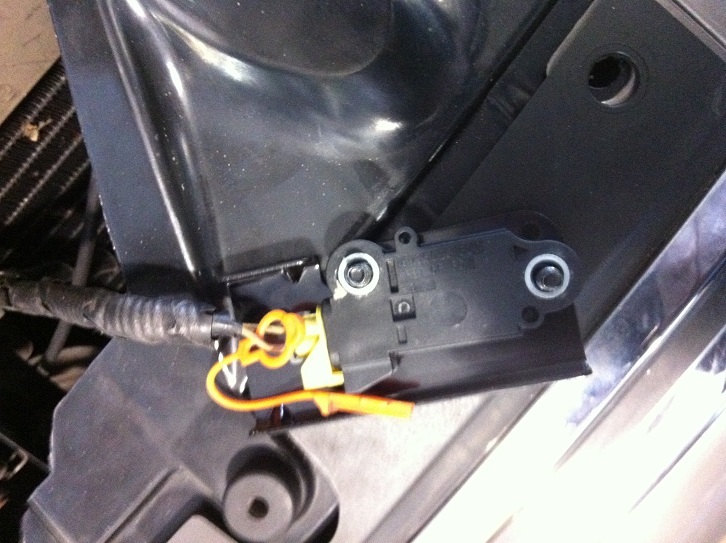 The front sensors are most common problem.